I wish to start a guild for the mana world underground, brotherhood of thieves and murderers. Only the chosen ones should get their hands on these black evil robes. Although robes should definitely be made when someone finds the time note that any new items we bring into the game will be available to all players or no players. We won't bring any items into the game which are exclusive to one guild. zeeli wrote: I request a black robe with hood. Then you should start learning pixelart and try to pixel it for your own. I ensure you that community will help you with professional advice, reference and support. Remember that TMW is open source and everyone can (or even should) contribute. And don't try complain about that you are not artist or you can't. We will simply ask one question: "Have you ever tried to do that?" If you really wish to start that guild - ok no problem. But don't ask us for something that you need for your own purpose, and that you don't want to share with other non-guild players. I never saw the game with content restricted to the one group of normal players - non related to development team. I'm not sure if this has already been done. But here' my attempt. It's more like a cleric's robe than a mage's robe. The hooded one should look good but with the hood pulled back. I figured, the mohawk hairstyle would just go through it and make it look wierd. But there is no reason to have different kinds of robes. Slaves Robe looks more like a light silk robe while yours looks more heavy (although this impression might change depending on how you animate it). im fixing up these robes right now, seph pointed out some flaws im taking care of, and Crush, i can show you what they look like ingame if you log into Sirus sometime, i have them in black, blue, white, and pink already. like my avatar? i drew a concept of old savior plate which is now outaded in a bout 5 mins. if you have an avatar froma game you would like me to draw for you give me a PM. Thanks, but I already experimented with recolorisations of the sprite on a local server. Yes Crush, that was my intention. The scenario I thought of was this: It's a thick robe that can withstand some short blades or knives. And since it's heavy could be used by magic users minimizing damage to themselves but the weight would slow them down a bit. I'm thinking of adding another robe by recoloring it to be deep red and add some jewelry pixels. If you guys like this, I'll go ahead with the female version. Otherwise... back to the old drawing board... errr desktop ummm Gimp. It still lacks shading. Keep the light direction in mind. 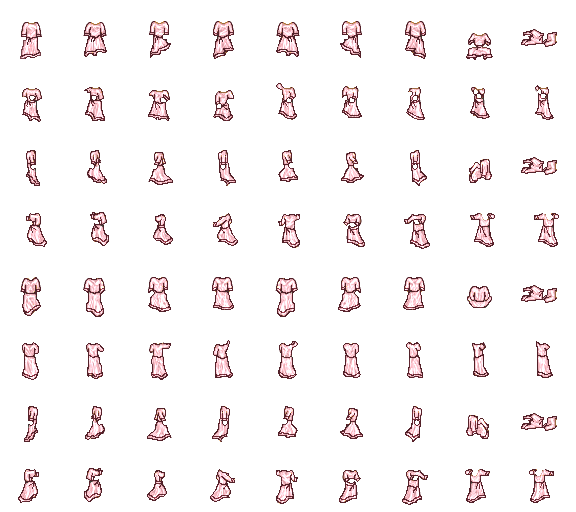 You should also get rid of this line in the sideview sprites and maybe shade some folds in the lower part. Thanks for the comments Crush. I found the smudge button and did some shading. Although I am not a fan of "dirty" tools like smudge and rather prefer "clean" oldschool pixel art techniques I must admit that it is definitely an improvement. But nevertheless it is not really knocking me off yet. Unfortunately I got no idea what exactly is missing. Maybe someone else can give some more input on this. How about a female version? Crush wrote: Although I am not a fan of "dirty" tools like smudge and rather prefer "clean" oldschool pixel art techniques I must admit that it is definitely an improvement. How about adding a layer and trying some belts on it. If its a simple robe how about some sort of rope belt. A belt? Yes, that's it. I suggest a brown rope with an end hanging down on one side. Mon, did you already try it out ingame? I just did and noticed that the collar seems to move a bit up and down while walking, the skirt part of the back walking animation looks weird (the folds seem to flap uncontrolled) and the spine line on the back looks not like it should be there (it is a very thick fabrick - the spine should not be visible under it). The skirt part could also be one or two pixels wider, in my opinion. When you don't know how to test it ingame I could create a customdata zip file for you and give you instructions how to use it. Black Don & Crush. Thanks for the comments guys. I really appreciate it. I am already in the process of making the female version. I also managed to add the file to the game. It's really hard to tell which part of the frame the robe jumps up. You could reduce the animation speed by editing the .xml file of the sprite and increase the delay of the animation.